Prosthetic limbs have come a long way since the crude wooden peg legs and hook hands of previous generations. We now have robotic legs, hands that can actually grasp objects, and numerous other amazing advances. 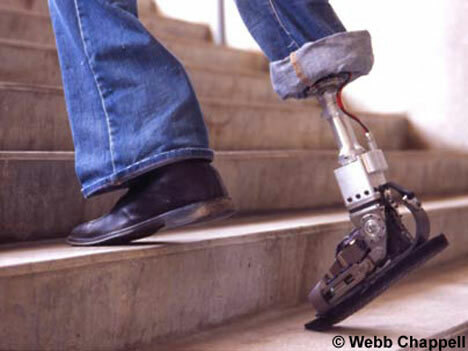 Above, the world’s first robotic ankle reduces the amount of energy expended on walking by the amputee. It was designed by MIT engineers for injured Iraq war veterans, and it is a history-making device due to its unique way of propelling the user. Rather than a simple spring, the ankle contains a small battery-powered motor that harvests energy from the user’s own movements. The bionic ankle gives users a more natural gait than any previous prosthetic leg or foot. The complex functions of the human hand have made the hand a notoriously difficult part of the body to replicate with prostheses. Prosthetic hands can range from the purely ornamental to the amazingly functional. 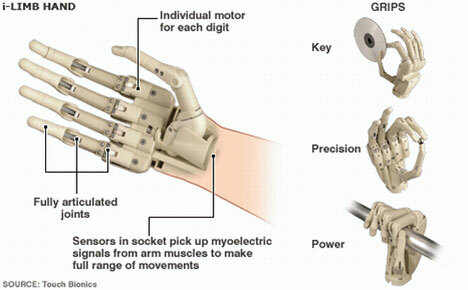 The hand above is known as the i-LIMB, and it’s the first commercially available bionic hand. It won the 2008 Royal Academy of Engineering MacRobert award for its incredible functionality and brilliant design. Each finger has its own motor powered by myoelectric sensors, and the hand functions almost as precisely as a human hand with no controls other than natural muscle movements. This type of fully-articulated hand with individually-powered digits is truly the future of prosthetic hands: it allows people who have lost hands to function just as they did before. Finally, prosthetic limbs are usually anything but attractive. They are built for utility, not for looks, and usually end up looking like it. While in design school, Joanna Hawley decided to change all of that with an Eames-inspired prosthetic leg. Charles and Ray Eames revolutionized the design world with their classy minimalist aesthetic and brilliant use of non-standard materials, two characteristics that lend themselves very well to this prosthetic leg concept. Rather than looking like a piece of machinery, the leg looks like an accessory that shows off the personality of the wearer. See more in Cybernetics or under Technology. September, 2010.